I’m sure you’ve been asked this question and have done the asking many times. Then we ponder. Some people want the bad news first so they can get it out of the way and end the conversation with the good news. Others want to start with the good news in hopes people forget about the bad news. Sometimes the good news and the bad news go hand in hand and the good news far outweighs the bad news. That was good news then and it is good news now. Jesus IS the Good News. Don’t let the bad news of all the evil in the world get you bogged down. Jesus is good news. Trust Him and have that good news in your heart to share with others every day. 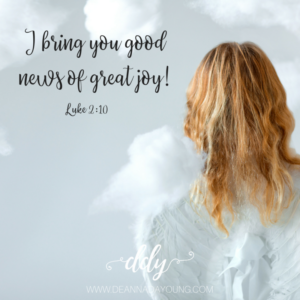 I don’t want any bad news…just give me the Good News!